Arriving at the station this morning I was greeted with an announcement that my train had been cancelled, this of course just after I had brought my tickets. When I got onto the next train that would take me where I wanted to go I got one of the luxury bipedal accommodation slots with a convenient backrest marked “Drivers door. Do not block”. From my rather upright position I had superior views of the carriage and the parts of the verge closest to the train. I for one love the blurry effect you get from a fast moving ditch. Not long into the journey one of the third class passengers, who was struggling with his lower seated location, started to assemble a small selection of items. First he folded his copy of the FT to fit neatly on the table, as a makeshift tablecloth, then pulled out a small china cup, a tea bag, a pot of sugar and a flask of hot water. He then proceeded to make a rather nice looking cup of tea. 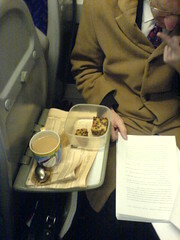 Just when I thought that my respect for this man could go no higher he reached down and pulled out a box of fruit cake. I think that he must have forgotten his plate today. I may have to look at getting the wicker basket tea set attachment for my bag for future trips if I am to keep up.